As always, thank you for your generosity and support of Arenal Mission, our sister community in Nicaragua. As you think about your year-end giving and tax planning, we would love for you to keep this important organization in mind. In addition to cash gifts, we are excited that we are now able to accept stock contributions as well, which can be quite tax advantageous (for more information). Here’s the link for the instructions. *Please note on your contribution that this is for the SCHOOL and for Mission Arenal. The Community of St. Thomas More has been involved with Arenal, a small village in Nicaragua since 1994. The relationship began when former STM parishioner and parent, Re Hatem, learned from former STM Associate Pastor Joseph Currie, S.J. of the work of his brother, Father Rob Currie in Arenal. Father Rob is a Jesuit Missionary and has lived and ministered in the Arenal community since 1987. He has become a true resident of the village.Since 1994 the Community of St. Thomas More, through monthly Mission Collections at school Masses, Friday Ice Cream Sales at the school, Coffee Sales during Fellowship weekends and parishioner contributions, has raised and sent over $110,000 to aid the people and work of this small Nicaraguan community. Donations from the STM Community have contributed significantly to the entire Arenal Community. Initially the support only involved sending school supplies so that the Arenal school could remain open as their school would close when it ran out of supplies. Our involvement and donations have not only kept the lower schools open, but have helped finance the higher education of young adults in the Arenal community. In 1999 the Arenal community sent their first young adult to the University in Managua using donations from the STM Community! Since then 10 young adults have graduated and 24 are still pursuing their higher education. This is quite an accomplishment considering that only 50% of school age children in Nicaragua ever receive any formal education. Arenal has a 98% attendance rate! Most significantly these young adults have RETURNED to Arenal to become community leaders. They have returned to the Arenal Community in varied professions: as teachers, as nurses, as engineers, as financial consultants working with organizations that make credit available to small farmers, as organizers of women’s groups to deal with issues such as domestic violence and gender rights and one is working overtime coordinating all of the community activities. In addition these individuals have also started a center for alternative reading for the little ones in the community. Our solidarity with Arenal over the years has helped to restore their health center. Such supplies as thermometers, medical equipment (including nebulizers, microscopes, and centrifuges), and medicines have made it possible for a doctor to provide the Arenal community with basic medical care. Jane Waddell, the STM School Music teacher and her husband, Bill, both trained Emergency Medical Technicians with the Orange County Rescue Squad have traveled to Arenal on our behalf to deliver supplies, donations, computer skills and medical support to the community. They stayed with a host family for 2 weeks and have learned first hand about the needs and the spirit of the community. As a result of all of these efforts there has been a marked drop in the number of diseases and illnesses in the community. 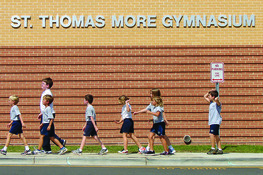 Jane and Bill Waddell have been instrumental in sharing the life of this close knit community with all grades at St. Thomas More Elementary and Middle School giving the children not only a sense of the greater needs of humans in the 3rd world but also exposure to a colorful and vibrant community. Over the years our donations have helped to purchase a generator (affectionately known to those of the STM school community as the “delapidator”) to enable women of the village to raise and sell chickens. The money from the sale of chickens is used to purchase seeds and fertilizer to grow crops to feed the village. Funds have also helped villagers to maintain a community transportation system (two pick up trucks). And most recently the youth in Arenal have developed a superb traditional dance group that visits other communities and Central American countries to share, through dance, the village workers’ life struggles and triumphs. This dance group has helped to keep alive their historical and cultural traditions in a time of globalization and mass commercialization. If ever there was a Mission that has seen REAL results from the Community of St. Thomas More, it is Arenal, Nicaragua. Arenal is a village of determined and hard working people. The greatest gift we have given them is the gift of HOPE! The greatest gift we have received is awareness that we CAN and ARE making a difference in the life of a community beyond our borders.